In a corner of Ecuador in Patután, Cotopaxi [en], the people are connected to the world thanks to a blog: #ruraleando . 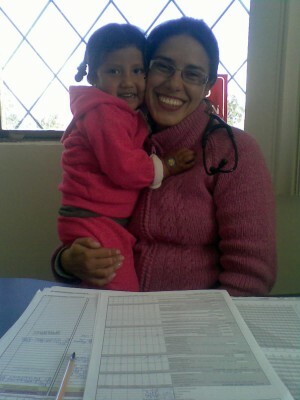 It's likely that the patients who visit this parish's Health Clinic have no idea that each day at the end of her shift, Denisse Calle (@niches13 ) publishes, without fear or self-censorship, the problems and progress of the health system, and tells of what she has lived since beginning her placement as a rural doctor. She does this because she knows what she's talking about: she questions, analyses, tests and proposes solutions. If you have a look at #ruraleando , you might stop to read about day 112 , when Doctor Calle met Segundo, an addict in rehabilitation who arrived with an intestinal infection, and left smiling ear to ear after being given a new opportunity to begin again. There is also the story of a 29-year-old patient  with high glucose levels, who, after arriving at the hospital for testing was simply told that he looked fine, and should come back four days later –and not one test was performed! In the same post, the author tells of her encounter with Marlon, a child with special needs who came to the clinic and was entertained by the music of Pink Floyd. These are every day stories, so common that they seem normal. The blog teaches us to look further than the distraction of medicine as a profession, a profession which no longer centers itself in the patient, bur in endlessly dolling out prescriptions and medical exams. Its pain touches us while reflecting upon the human element in a community's problems. Thanks to the blog, Denisse was able to make contact with national representatives in Health and tell them of needs which would go unseen, unfelt or unlived unless they become a part of this reality. A man, motionless on the asphalt, a crowd of 20 people and two policeman around him…and no one, NO ONE, came forward to even feel his pulse…I knelt down and when I was about to touch him, the police asked me “What are you going to do? You can't touch him, you can't do anything to him!” to which I replied “I'M A DOCTOR!” and they gave me permission. Yes! It sounds absurd! Authorizing someone to help a stranger who's suffered an accident, while you ask the people around whether they saw the vehicle that hit the person, where it went or what color it was. In July, Denisse received an invitation  to be part of the Seminario-Taller Internacional ”Retos Actuales de la Salud Pública en Ecuador y Vigilancia Ciudadana de las Políticas Públicas y Servicios de Salud”  [International Lecture-Workshop “Current Challenges in Ecuador's Public Health and Civic Vigilance of Public Policy and Health Services”], and Nobel Prize winner in Medicine, Thomas Südhof  [en], even responded  to one of her queries through the BBC .